Join SGSCA for the annual Summer Picnic! 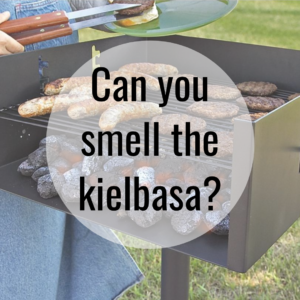 Prepare your tastebuds for grilled kielbasa, hamburgers and hot dogs (provided) plus Paul’s famous bigos! Not to mention delectable delights brought to the table by our members and friends. Quench your thirst with an assortment of non-alcoholic beverages (provided). 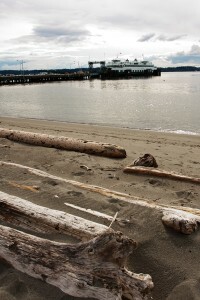 Enjoy the Puget Sound and Olympic Mountain views from the shores of Lincoln Park. Take a stroll on the beach. Enjoy conversations with members, friends, and guests including our business week students and city officials from Gdynia. SGSCA members and guests had a ‘wheel’ fun time at this year’s annual picnic. Ron showed off his beautiful T-Bird and took guests for spin. 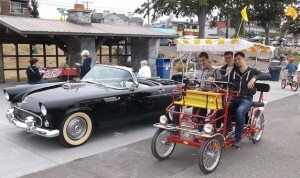 Then we had one of the Surrey carts for a couple of hours and let guests take it out for a ride up and down the street. Special guests were our exchange students who shared their experience at Washington Business Week and then presented SGSCA with a plaque from the city and a special print for Barbara Lee in thanks. The students were given ‘goody’ bags filled with souvenirs. All in all it was a great day for bigos and polish sausage! To see images taken at the picnic by Paul Griffin click here! Everyone is invited to the SGSCA annual summer picnic. Members, family and friends are invited to join us from Noon – 5pm at Lincoln Park, Shelter #4. Cruise on over to West Seattle for an afternoon of good eats, lively conversation and a breath of fresh air. You’ll also get to meet this year’s Gdynia Exchange Students. We’ll provide the Kielbasa, hot dogs & chips, and Bigos, along with your favorite soft drinks and water. Please bring your favorite salad or dessert to share with everyone if you can.